Even in winter, watering your lawn properly is essential to long term health. We finally got a good soaking rain this past weekend…but when was the last time that happened? Unfortunately, the very warm winter has meant that most lawns in Dallas never went fully dormant. A lawn that isn’t dormant will still need some supplemental water and care throughout the winter. Well, we didn’t get the rain and most homeowners didn’t water their lawns this winter. What does this mean? Potentially, this means we’re going to see a lot of damage to lawns as the spring growing season comes on. Die out from lack of water, combined with increased fungal disease pressure as TARR (Take-All Root Rot) and Brown Patch take advantage of weakened lawns. Watering your landscape in the winter is just as vital as during the summer months, especially when we go weeks without rain. Winter lawns that are already stressed from improper care could become more susceptible to pests throughout the year, and soil microbe populations will most likely suffer if not watered properly. Protect your lawn and investment by keeping a regular watering schedule even through the winter months. 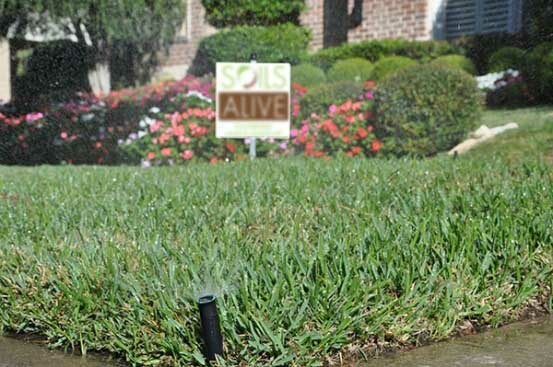 Below the soil, microorganisms remain active year-round, maintaining your soil’s health. Without adequate moisture levels in the soil their populations can suffer. Poor microbe populations can also make your lawn more susceptible to pests and disease. Dormancy is a natural response…but not so much this year. Many lawns across DFW did not go fully dormant. This means water is even more crucial than normal because the grass and roots have continued growing more actively than they do most winters. If your lawn looked as if it did go dormant (it all of a sudden looks really brown or yellow now) it could be that you didn’t water it enough. Lawns can go dormant due to unfavorable conditions, such as cold temperatures or drought. Even if your lawn did go dormant, you should still be watering about one to two times per month during the winter. If we have consistent rainfall, averaging an inch per week, then no additional water is required. Should I start watering now? Yes! Once the water from Sunday’s rain evaporates or is used up, you’ll want to start watering again.Check your soil next week. If you have not been watering through the winter months, break up your watering schedule into different run times on the days you water for better absorption and to avoid water runoff. We always recommend turning off the regular schedule on your automated sprinkler system during the winter months, so you don’t accidentally overwater. But that means you have to remember to manually water your lawn and landscape during dry spells. Once hotter temperatures arrive in March and April, you’ll want to turn your automated schedule back on, keeping in mind your local watering restrictions. In the absence of adequate rainfall, a deep watering once per week will suffice in spring and fall.